Happy Mother’s Day! Poor Miko had a bad week, on Wednesday night I noticed one of his front teeth was loose and worried it was a painful problem for him. Our awesome, busy vet was able to fit him in for an early appointment the next morning and the poor guy spent all day there getting knocked out and having two bad teeth removed. 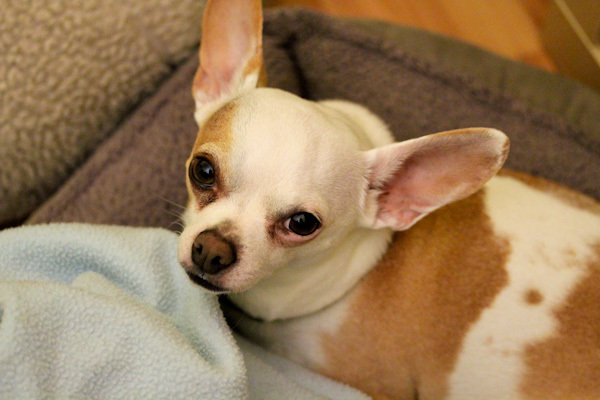 After doing a ton of reading and talking with the vet, there wasn’t much I could have done and Leela, our other chihuahua, has already had a couple of teeth removed. It’s a common issue for small dogs because their tiny teeth just aren’t as strong and I read that it’s possible they could loose all teeth by old age which means dinner from the Vitamix! Miko is recovering and on pain pills and antibiotics and seems to be his happy-go-lucky self. Friday night hubby and I had a lovely dinner at Il Fornaio on the patio while watching mall shoppers walk bay, the weather was perfect and I got my favorite vegan dishes. 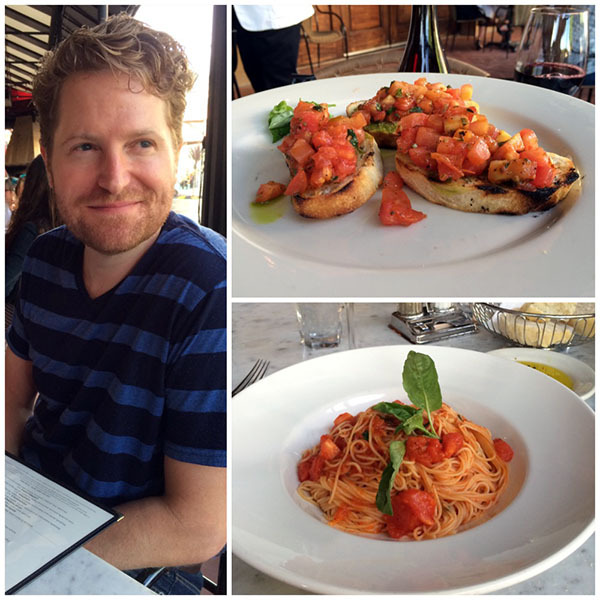 Carbs, fresh tomatoes, and wine are perfect therapy after a stressful week! Last night we had an informal family gathering at my sister’s house to celebrate our nephew’s last baseball game, Mother’s Day, recent birthdays, etc. And it was a fun and casual BBQ menu that consisted of whatever we could bring from our pantries and fridges. 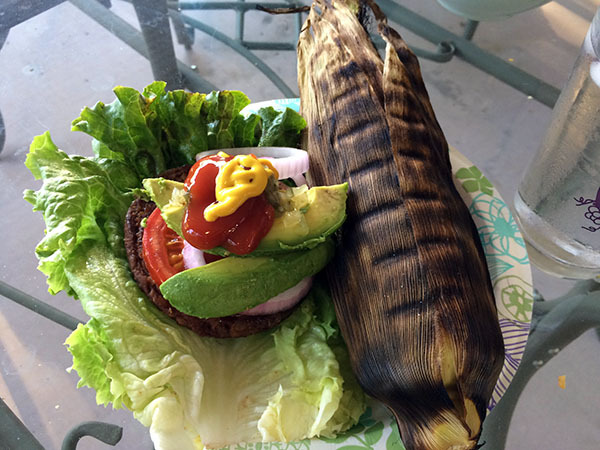 I grabbed our stash of frozen veggies burgers to take and assembled a pretty plate of a Gardein vegan burger patty loaded with avocado and fresh veggies and grilled corn. Thumbs up and corn grilled in the husk is awesome – sweet and steamed to perfection without being charred. I’ve also been doing a little shopping on Amazon. 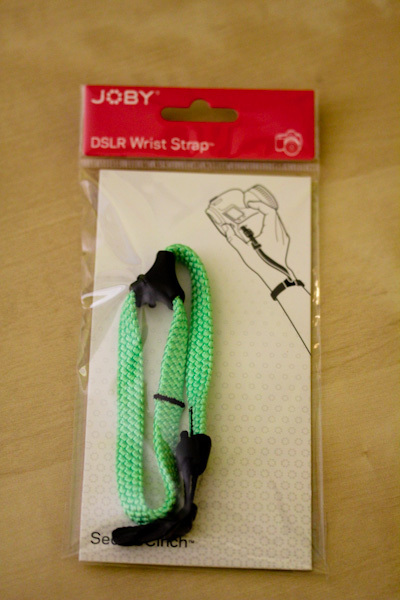 I picked up this light weight Joby wrist strap for my DSLR camera for upcoming trips because I’m not a fan of dealing with the awkward long shoulder or neck straps when I’m trying to remove the camera from a shoulder bag and snap quick pics at events, etc. And those huge straps aren’t needed when I have a small, light weight lens on it. So far so good, it’s comfortable and seems to fit securely onto the camera. I also picked up new vegan workout gloves which is not easy to find! I thought about these gloves, but they’re pricey with questionable sizing for my large hands, and a little over stylized! 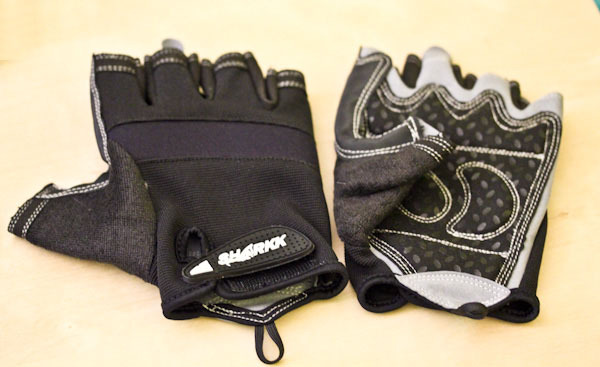 So I ended up grabbing these cheap SHARKK Gloves in a men’s medium size and they’re fine, almost a little large for me! Very easy to get on and off, washable, and handy terry cloth area for absorbing sweat. Thanks to Erin over at Olives for Dinner, I won a new vegan book! 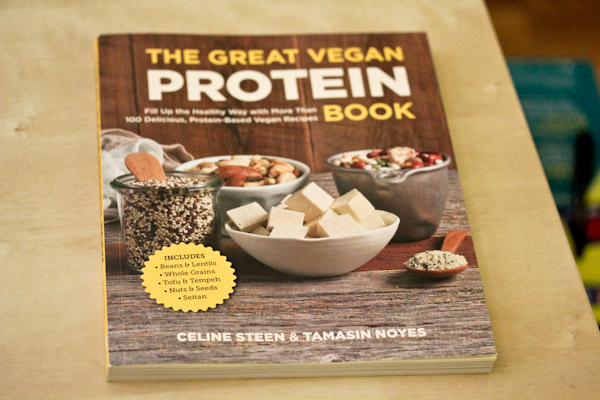 The Great Vegan Protein Book. Lots of great high protein vegan recipes and creative inspiration for packing more protein into dishes, looking forward to trying the recipes with hubby! And I’ve been doing some more interesting reading this week. This article is a fascinating look at how future generations will view factory farming practices today and how we’re continuing to grow morally as a society. This is an encouraging story of plant-based food companies making themselves heard to the USDA and the USDA recognizing that less meat is better for sustaining our health and environment. And The Sacramento Bee recognized a plant-based diet will help save water in California’s extreme drought conditions. UC Davis has a great, in-depth read on why oils are bad for us by promoting heart disease, being nutritionally void, solid fat and calories, bad for our immune systems, etc. and has great links for cooking without oils. OneGreenPlanet has wonderful plant-based recipe inspiration for Mother’s Day if you’re still looking. This is a great article for just getting started with a plant-based diet. Finally, here are seriously cute pictures of a therapy dog and his best friend rat. Sorry to hear about the dental issues with Miko! Glad he seems to be re-cooping good, tho! That cookbook looks neat! Love all the fun purchases as of late, too! And the FOOD!!!! Yum! Your husband’s wavy hair looks good, too! That may be the longest I have seen his hair thus far – in your photos! Poor Miko, that’s the curse of being a little dog. My Gizmo has the same issues and my min-pins before him. Thanks, he’s doing better now. But I was so worried about him at the vet! Thanks, looking forward to grilling more corn this summer! Yikes on poor Smokie, sorry for the stress and that adds up quick! Hope he pulls through okay and you too!